Spoiler alert! 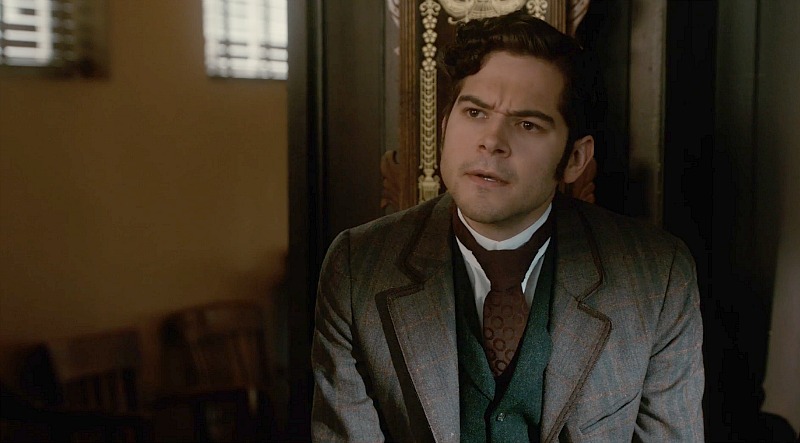 Do not continue reading until you have watched the latest episode of Murdoch Mysteries, “Murdoch Schmurdoch”! As I wrote in my preview, “Murdoch Schmurdoch” is a bit of a departure for Murdoch Mysteries. Yes, there was a crime—the death of a theatre owner—which meant Dr. Ogden, Brackenreid, Higgins and Murdoch were all involved. But viewers were given an in-depth peek into the life of Det. Watts (Daniel Maslany) as it was revealed he’s actually Jewish. I found that insight to be highly enjoyable, as was the performance of Sayer Roberts as the legendary Al Jolson. How were you and Robert teamed up to write this episode in the first place? Lori Spring: I had gone into Shaftesbury with Bobby to pitch a series based on one of his unpublished novels. They knew that Bobby and I were trying to work together and they teamed me up with him. We went into the writer’s room together. Bobby is an experienced novelist and less experienced screenwriter so it was somewhat of a mentoring situation. Robert Rotenberg: I’ve really wanted to get into TV screenwriting for years. I was talking to Christina [Jennings] and she mentioned her good friend Lori Spring. Lori Spring and I went to summer camp together when we were 15 years old! Lori and I got together. I came up with the idea of Al Jolson coming to Toronto when he was 18, they loved the idea and asked me to co-write with Lori which was the best thing that could have happened. I kind of went to screenwriting school for two months with Lori. It was incredible. How did the main storyline, regarding anti-Semitism, break? LS: The starting point was actually that Bobby had pitched Al Jolson as a historical guest character. He would have been around 19 years of age at that time. Then there was the general idea that he would have been in Toronto doing a performance. We had also sent some research notes because, at that time, there was a large influx of Eastern European Jews to Toronto in the late 19th century and earlier 20th century. By 1906, there were a number of Jews that were trying to initiate Yiddish theatres in the city. That became something that we wanted to work with. And Al Jolson was Jewish. So those were two threads that established themselves early on. Then we had the idea that one of the characters would find out that he was Jewish and Pete was really enthused about the idea of Watts discovering that about himself, so that became the B-story. RR: One day, we were driving to the set and I turned to her and said, ‘I think we have too many characters.’ We walked in and said, ‘We’ve taken two characters and turned them into one.’ We had the producer and a director and it just became too complicated. It was much easier to make it one character, Levine. And we had an M.C. but decided to just let Levine do the introductions on-stage. It really ended up being a Watts-centric episode and I loved that. LS: Yes, and that was the intention. RR: That was really fun. The original idea was that it would be Crabtree because they’re still kind of vague about his background. I loved the idea of someone hearing a tune and realizing that they’ve heard something from their childhood and putting it together. Then, they suggested it be Watts, which was a perfect fit. That’s a lot of responsibility for you two. You shaped this character’s backstory. LS: His tone has been established. Having worked on this show for so many years, the characters have sort of formed themselves and their backstories get filled in more and more every season. It’s not as if in the beginning of the show, William’s backstory was clear to everybody. It kind of fills itself in with every season. Watts is a latecomer to the season and it’s been a really interesting process. Al Jolson really did visit Toronto and performed at The Royal Alexandra Theatre, but later than in your timeline. I always love the little details and there were a couple in this episode. The Flatiron Building cutout was fun, and so was having Al Jolson turn around to show him just beginning to put on the blackface that would become his schtick. LS: We really talked a lot about how to handle that. When he was the age he would have been in 1906 that was when Al Jolson started to do blackface, but we didn’t want to go heavy on the blackface because it’s pretty loaded. It wasn’t loaded back then. It was viewed quite differently back then and Al Jolson wasn’t the greatest guy in the world but was well thought of by black performers because he was very progressive in his racial politics. RR: Historically, blackface was considered a very liberal at that time, which is completely opposite to what we think now. There were a lot of black performers at the time and it was considered as honouring them. You wrote a very sweet storyline for John Brackenreid, having him fall in love with Charlotte. He’s such a blank canvas. LS: [Laughs.] And to write scenes like that, you really start to fill in the colours. It’s fun to pretend you’re a 16-year-old boy in 1906 Toronto! What did you think of “Murdoch Schmurdoch”? Let me know in the comments below!